Good morning everyone, it is starting out to be a nice day today. It is 73° & sunny now going up to 83° today. Today is one of our cool ones. Going up to 79. Nice considering we have been above 90. Today is better weather for the dirt pushing I will be doing today! 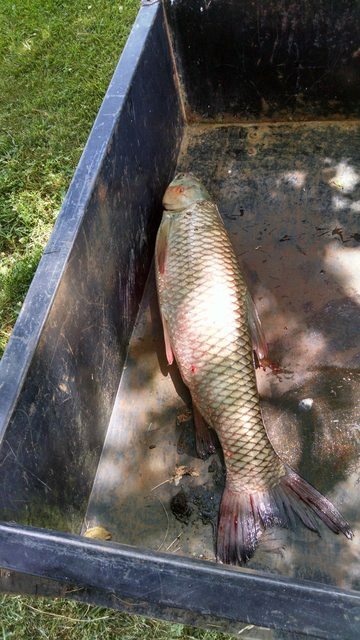 I caught this 12lb 32" grass carp out of our pond yesterday,talk about a fight lol. There's still 5 in there but I'd like to get it back down to 2 so I can put some cover plants in there for the fish and lower my chances of the grass carp eating them. They're hard to catch on a fishing pole and I wasn't even fishing for them,I was using a green night crawler and I guess it thought it was grass lol. Well, got some things done on that Expedition. Got the rear wiper motor assembly fix. Got permatex rear defroster tab repair kit to put the tabs back on glass grid.The air vents stop working when you gave it gas and going up hill, replaced a few vacuum lines now that's fixed. Still have one line I can't find where it goes. squirrelhunter wrote: I caught this 12lb 32" grass carp out of our pond yesterday,talk about a fight lol. There's still 5 in there but I'd like to get it back down to 2 so I can put some cover plants in there for the fish and lower my chances of the grass carp eating them. They're hard to catch on a fishing pole and I wasn't even fishing for them,I was using a green night crawler and I guess it thought it was grass lol. Something smells a little fishy to me..
You might be headed into a custom drive shaft but aside from that seems doable. Going to be a lot of work. There is a place up here that will do anything to a drive shaft if you don't have a source. Work has used them dozens of times and I have once so far, they saved me like 250 not having to buy a complete propeller shaft for a 99 CRV I had. Good morning everyone. It is 72° now with a high of 78° today. Might be a good day to replace the r/s hub & bearing assembly. edit: i don't really go on here a lot; this account is basically a joke. time to (probably) post something that isn't a joke/meme/idk. hows everybody doing? It's almost one and the weather says "feels like 90". You have been awarded the Tom Richmond trophy for your excellence in how to conduct yourself among adults! I am not that old! Does anyone have experience with the Rough Country lift for our trucks? They offer a 5" for $999.95 with free shipping. They also have a front drive shaft for $399.95. It seems pretty quality and still cheaper than the Superlift. Also, everyone says Superlift shocks are horrible, so maybe Rough Country's are better. I don't have experience with either. Rough Country's website says it comes with 100% of everything you need. Brake lines, hardware etc. It says some minor cutting may be needed but that's expected. They rate it for 33's but I've ran 33's on a stock FX4 with no probs. I'm sure 35's maybe even 37's are possible with this lift. 35's sure, no way 37's are fitting. Lifting the truck does nothing to increase clearance inside the wheel well. they will rub when you turn. I always wanted to take an Extended Cab Ranger, and attach the back half of a 2nd Gen Bronco to it ! Not sure of what frame or what cab would would work, but it would have been different. I would never throw anything larger than 33s on a Ranger anyway. Cant say I'm going to purchase a lift, but I was just curious if anyone heard anything about the RC lift. +1 on the Bilsteins. I'm happy with my new Rancho's, especially at half the cost of the Bilsteins...though I do know Bils are known for a quality product. I would like build it someday. The ultimate Ranger would be a Mexican 4 door crew cab long bed. We can all dream right? When I was in Afghanistan working as a contractor I had a right hand drive, 4 door, 4x4, 5-speed, turbo diesel with a 6' bed. It had a 22 gallon add-on fuel tank. It was the Mazda version of the Ranger - everything was different than the American version. It had a lot more get up and go than my 3L. What size Diesel is used in the Mexican or other Rangers of the World ? I'd like to see a 2.7 ecoboost swap into a Ranger. Maybe even a 3.5 ecoboost! Page processed in 0.3232 seconds (27% database + 73% PHP). 133 queries executed.